The Common Law Admission Test (CLAT) for admissions to the under-graduate and post-graduate degree courses (LLB and LLM) of 14 NLUs will be held on 11th May 2014. 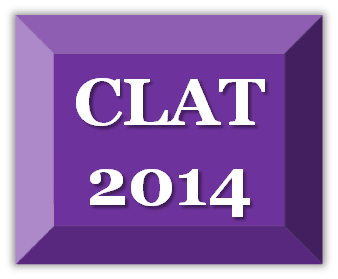 Common Law Admission Test (CLAT) will be conducted by the Gujarat National Law University, Gandhinagar in 2014. Career Nurturer is your Career Counselling Centre, Aptitude Test Centre, Career Guidance Centre, Resume Writing and Job Interview Trainer providing services in Mumbai, Thane and Navi Mumbai regions. We provide these services at the convenience of your HOME. 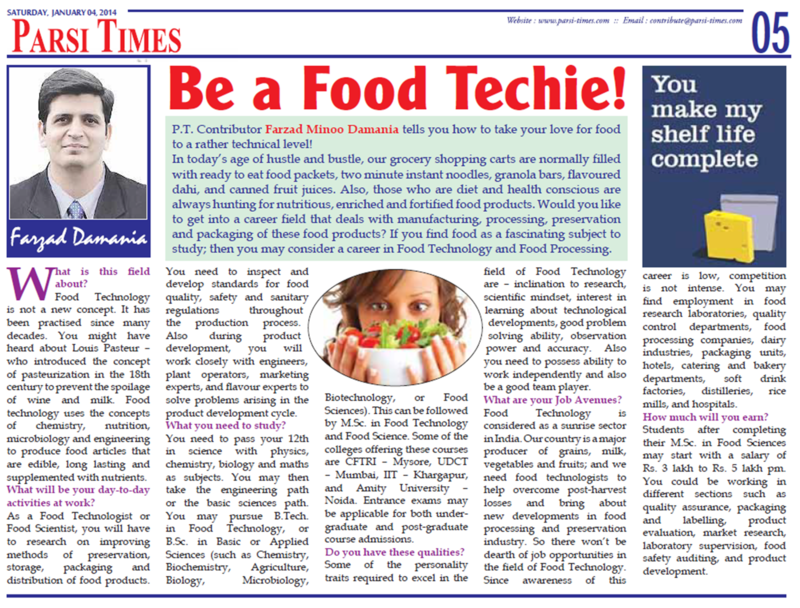 Farzad Minoo Damania – Career Counsellor and Founder – Career Nurturer provides insights into the field of Food Technology and Food Processing in India. Article Title: Be a Food Techie! P.T. Contributor Farzad Minoo Damania tells you how to take your love for food to a rather technical level! In today’s age of hustle and bustle, our grocery shopping carts are normally filled with ready to eat food packets, two minute instant noodles, granola bars, flavoured dahi, and canned fruit juices. Also, those who are diet and health conscious are always hunting for nutritious, enriched and fortified food products. Would you like to get into a career field that deals with manufacturing, processing, preservation and packaging of these food products? If you find food as a fascinating subject to study; then you may consider a career in food technology and food processing. What is this field about? Food technology is not a new concept. It has been practised since many decades. You might have heard about Louis Pasteur – who introduced the concept of pasteurization in the 18th century to prevent the spoilage of wine and milk. Food technology uses the concepts of chemistry, nutrition, microbiology and engineering to produce food articles that are edible, long lasting and supplemented with nutrients. What will be your day-to-day activities at work? As a food technologist or food scientist, you will have to research on improving methods of preservation, storage, packaging and distribution of food products. You need to inspect and develop standards for food quality, safety and sanitary regulations throughout the production process. Also during product development, you will work closely with engineers, plant operators, marketing experts, and flavour experts to solve problems arising in the product development cycle. You need to pass your 12th in science with physics, chemistry, biology and maths as subjects. You may then take the engineering path or the basic sciences path. You may pursue B.Tech. in Food Technology, or B.Sc. in Basic or Applied Sciences (such as Chemistry, Biochemistry, Agriculture, Biology, Microbiology, Biotechnology, or Food Sciences). This can be followed by M.Sc. in Food Technology and Food Science. Some of the colleges offering these courses are CFTRI – Mysore, UDCT – Mumbai, IIT – Khargapur, and Amity University – Noida. Entrance exams may be applicable for both undergraduate and post-graduate course admissions. Some of the personality traits required to excel in the field of food technology are – inclination to research, scientific mindset, interest in learning about technological developments, good problem solving ability, observation power and accuracy. Also you need to possess ability to work independently and also be a good team player. What are your Job Avenues? Food technology is considered as a sunrise sector in India. Our country is a major producer of grains, milk, vegetables and fruits; and we need food technologists to help overcome post-harvest losses and bring about new developments in food processing and preservation industry. So there won’t be dearth of job opportunities in the field of food technology. Since awareness of this career is low, competition is not intense. You may find employment in food research laboratories, quality control departments, food processing companies, dairy industries, packaging units, hotels, catering and bakery departments, soft drink factories, distilleries, rice mills, and hospitals. Students after completing their M.Sc. in Food Sciences may start with a salary of Rs. 3 lakh to Rs. 5 lakh. You could be working in different sections such as quality assurance, packaging and labelling, product evaluation, market research, laboratory supervision, food safety auditing, and product development. 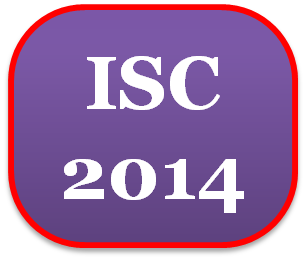 CISCE has announced the exam timetable for ISC (12th) board exams to be held in Feb 2014. Best Wishes to all aspirants of ISC Exams in 2014. Once you are done with your board exams, you must be confused about what to do next. There are several career options after 12th that you may consider. But which career will suit you depends on you aptitude and other factors like personality and interest areas. Career Nurturer’s Career Counselling Centre help you understand what you understand what career suits you based on aptitude, interest, personality and emotional intelligence assessment tests. Our Career Counsellor in Mumbai (Farzad Minoo Damania – 9833971773 or farzad.damania@gmail.com) conducts psychometric and aptitude tests and provides career guidance to help you make the right informed career decision after your 12th. Career Nurturer is the place for career guidance and career counselling for students who pass their 12th board exams.